Canine hypothyroidism is most commonly caused by an autoimmune disease, resulting in not enough circulating thyroid hormones. If thyroid disease is suspected your veterinarian will run several diagnostic tests to rule out other causes and confirm diagnosis. Treatment involves supplementing the thyroid hormones and will need to be monitored to find the proper levels and alleviate symptoms. With canine hypothyroidism the symptoms can affect several body systems and your dog will need lifelong treatment to supplement the lacking hormones. In the case of primary hypothyroidism (the most common), proper treatment will resolve symptoms and your dog's prognosis and lifespan will be normal. Your vet will do some blood tests to check for hormone production coming from the pituitary gland and the thyroid since the pituitary signals the thyroid gland to produce hormones (called a TSH, T3 and T4 tests). The primary test to conduct is a TSH stimulation test, which is considered to be the most reliable way to diagnose the condition. Since the test is expensive, veterinarians might substitute alternatives such as a T4 test and a TSH assay test. 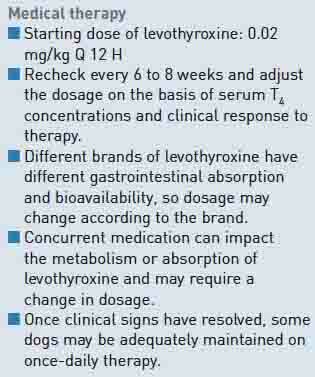 If T4 levels are normal, they it is unlikely that a dog is suffering from hypothyroidism. The urinalysis is used to rule out other causes and to check cholesterol and triglyceride levels. At times the urinalysis will find a urinary tract infection. 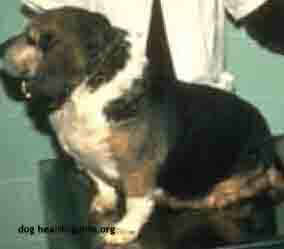 (3) 75% of dogs suffering from elevated cholesterol are hypothyroid dogs, a condition called hypercholesterolemia. If TSH levels are higher than normal than it is the pituitary working overtime trying to stimulate a thyroid gland that isn't working. Net, if the pituitary levels are too high and the thyroid levels are too low, then a diagnosis of hypothyroidism will be made. Testing also looks for underlying causes such as cases where the immune system of your dog is attacking itself called autoimmune thyroiditis. This type of thyroid disease starts between the ages of 2 and 5. Most dogs will be testing for the condition starting in the 4th year of life since this is when the majority start showing antibodies for the disease. The blood sample should be taken when your dog is otherwise healthy, is not in or approaching a heat cycle, and is not on medications like steroids, anti-inflammatory drugs, or anti-convulsive medications. 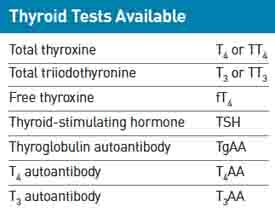 Usually a 3 month window before testing is needed if any thyroid drug is being administered. Even if tests are not clear or the underlying cause has not been identified, your veterinarian may choose to start canine hypothyroidism treatment to see if the dog responds to therapy. Other factors that can result in a misdiagnoses include certain commonly used medications. A veterinarian will use X-rays to detect bone problems in dogs that are potentially suffering from congenital canine hypothyroidism. An ultrasound test can detect differences in thyroid gland volume and can be used to evaluate hypothyroidism in dogs. It is used in addition to other diagnostic tools. If a dog has been recently vaccinated, it creates an increase in antibody levels. This can cause a hypothyroid dog to appear as if they have a normal thyroid. To avoid the problem do not conduct any tests within 2 weeks of being vaccinated. 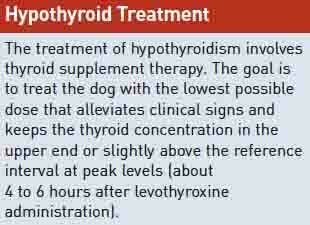 Canine hypothyroidism treatment involves 1x or 2x daily treatments of replacement hormones called L-thyroxine (T4). The level of hormone therapy is based on your dog's weight. Your veterinarian will repeatedly do blood tests until the right level is found. Avoid generic medications since in humans generics have been found to have wide variability in the body's ability to absorb the medication. Dogs with other metabolic related conditions such as kidney disease or heart disease will start slowly with thyroid supplementation. This dose will be increased gradually over a 3 month period. If your dog does not respond to thyroxine (T4) treatment, causes include a problem with the prescribed dosage/frequency that your dog takes the medication, an inability by the dog to absorb the medication, or a misdiagnoses, which requires additional testing. A veterinarian might try different brands of hormone to see if the patient reacts differently. If T4 levels are above normal, the medication will be decreased, while low levels indicate that the dose should be increased. 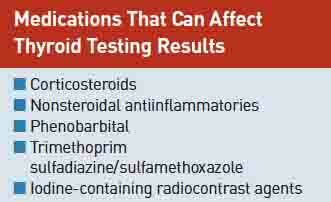 It is important to administer medications as prescribed or tests will not provide reliable results. A month or two after beginning treatment, your veterinarian will want to redo the blood tests to make sure the levels are now within normal range. Blood should be drawn 4 - 6 hours after the morning dose of levothyroxine. Dogs on long-term thyroid medication should have blood work done every 6 - 12 months. After 6 weeks of canine hypothyroidism treatment, the patient will be tested for thyroid function, followed by testing every 6 to 8 months and then 2x per year. Blood tests are conducted 6 hours after the T4 pill is taken. Several medications when used along with hormone replacement therapy can increase a dog's metabolism. These include NSAIDs (arthritis, pain relief medications), Glucocorticoids, and furosemide (diuretic used to treat hypertension). With canine hypothyroidism treatment your dog should resume normal behavior and health in several weeks. When your dog starts to recover, natural remedies can play a supportive role in maintaining thyroid health. Primary hypothyroidism can be easily controlled with an excellent prognosis. Improvement is seen in as little as one week, with dogs showing improved activity levels and higher levels of being alert. Skin condition should improve as well, with full resolution taking as long as 3 months. The same length of time is needed for neurological issues to clear. The life expectancy of dogs being treated for primary hypothyroidism is normal. Congenital hypothyroidism has a poor to guarded prognosis. To restore and maintain thyroid function, a product such as Thyro-Pet could be of help. To help restore any lost hair and overall skin condition, use of a natural tonic such as Skin and Coat Tonic to help restore skin and coat condition and a high quality medicated shampoo such as Snder Labs Richard's Organic. Clin North Am, Small Animal Pract 2007;37, 617–631.